The Eleanor and Thomas P. Hackett Memorial Award is the Academy’s highest honor. It is presented to a member who has demonstrated distinctive achievements in CLP training, research, clinical practice, and leadership. The award was established in 1988 to honor Thomas P. Hackett, Jr., MD, FACLP, professor and chief of the Department of Psychiatry at Massachusetts General Hospital 1974-1988 and president of ACLP 1987-88. Dr. Hackett was a long-time leader in the field of C-L psychiatry. He died of a heart attack at age 59, two months after he took office as president of ACLP. The first Hackett award was presented in 1989 to Edwin H. Cassem, MD, FACLP, who also succeeded Dr. Hackett as chief of psychiatry at MGH, 1989-2000. In 2009 the award was renamed to include Dr. Hackett’s wife, Eleanor, who passed away of leukemia in April 2009. “Ellie” had presented the award at the annual meeting almost every year since its inception. She received ACLP’s Special Recognition Award in 2003. 1. Be a full member of ACLP for the past 10 consecutive years. 2. Achievement of Fellow status within ACLP. Active presentation AND active service at ACLP. Examples of active presentation at ACLP include serving as a moderator, speaker, or discussant for a preconference course or general session; or serving as the lead presenting author for a poster or oral paper session. Examples of active service to ACLP may include service on the Board of Directors, a committee, subcommittee, or taskforce, or service as a chair, co-chair, or vice chair of a special interest group. 4. Demonstration of significant contributions to advancing the field of consultation-liaison psychiatry. 6. Three letters of recommendation (LORs) to attest to the excellence of the four categories as listed above; collectively, the LORs should support all four categories. 7. Commitment to give a lecture at the same annual meeting awarded. Exceptions will be considered on a case-by-case basis. An exceptional candidate with extraordinary achievement that may not meet all requirements may be considered if deemed appropriate. Additionally, exceptional psychiatrists dedicated to the field of consultation-liaison psychiatry, and meeting all other fellowship criteria, but who are not eligible for ABPN certification in Consultation-Liaison Psychiatry, may be considered. 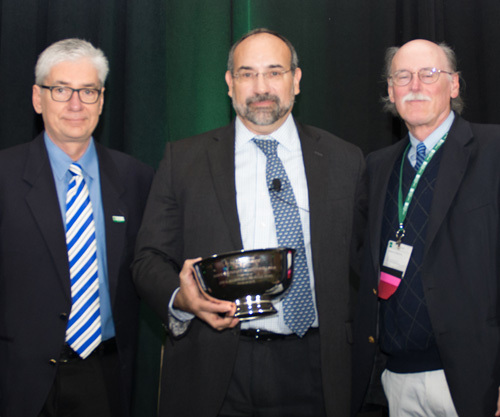 President Jim Rundell (left) presented the 2018 Hackett Award to José Maldonado (center). Dr. Maldonado was introduced by Dr. Theodore Stern (right). 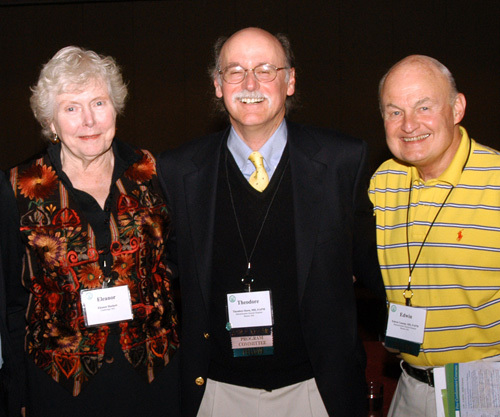 Eleanor Hackett at the 2008 Annual Meeting in Miami with the recipients of the last and first award she presented: to Theodore Stern (2008) and Edwin “Ned” Cassem (1989). Mrs. Hackett passed away the following April. Nominations for the Hackett Award are made only via the online Hackett Award Nomination Form. The nominee’s CV must be attached, as well as the three (3) letters of recommendation. Optionally, up to five (5) additional files of supporting materials may be attached, such as copies of title pages or table of contents for journal articles, title pages for books, letters of appointment for society and administrative offices, text of published posters, or other similar published materials. The nomination form with all required attachments must be submitted by April 1 to be considered for the award.